The kitchen is perhaps the most important space in a home. It is where meals are prepared, and it is a socializing space as well. Kitchen cabinets are probably the most dominant installations in a kitchen. They are also expressions of your style, tastes and preferences. 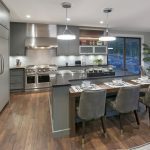 How can you select kitchen cabinets for a unique and awesome kitchen that is both functional and stylish? The functionality of a kitchen comes before aesthetic needs. A kitchen must fulfill the needs of the family. Kitchen cabinets play a big role in making a kitchen functional by providing storage space for foodstuffs, utensils and other appliances needed in the kitchen. When selecting kitchen cabinets ask the question, what needs to be stored? This determines the size of the cabinets. What style do you need? Kitchen cabinets dominate in setting the style and tone of a kitchen. Modern and contemporary styles feature glass doors, chrome hardware and neutral colors. Traditional styles go well with ornately decorated wooden doors, and dark stained sides. Shaker style cabinets are ideal in a transitional, clean style kitchen. If you are not very sure on the style, you can ask an interior decorator to make recommendations. What material do you prefer? Wood is the natural choice for kitchen cabinets, but different types of wood differ in appearance, durability and longevity. In Canada, the two top choices are maple and cherry. Maple is light in color and its grain pattern comes out well when stained. Cherry is a dark colored wood with a uniform appearance. Its rich dark hues also come out well when it is stained. Do you need RTA or assembled cabinets? Ready to Assemble (RTA) cabinets are cut in the factory and shipped to be assembled on site. RTA cabinets are easier to work with in an irregularly shaped kitchens where measurements may need to be adjusted. RTA cabinets need professional builders to install. Assembled cabinets are readymade in the factory and shipped to site ready for installation. These cabinets are easier to install. There are fewer defects as they are identified and rectified in the factory, although assembled cabinets are pricier for the convenience. Framed cabinets have a 1 ½ inch frame at the front of the cabinet to attach the door. This provides an edgy front with a stable and strong door. Frameless cabinets are found on European style cabinets. The door attaches directly to the side of the cabinet for a sleeker look. 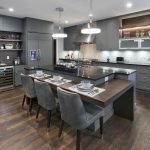 Do you need to install kitchen cabinets that make your kitchen uniquely stylish and functional? Contact Bow Valley Kitchens for professional consultation and installation to build your dream kitchen today.